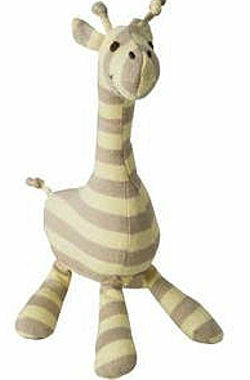 I am searching for an Old Navy yellow and tan striped cotton giraffe rattle, about 8″ tall, for my infant son. Old Navy carried this line of toys in the Spring of 2008. He was given this giraffe as a gift and is very attached to it, so I would like to find a back-up for the future before it’s too late. If you can help Allison find this Old Navy Yellow & Tan Striped Giraffe, THIS SITE IS NO LONGER ACTIVELY MANAGED. Please use Our FREE FACEBOOK GROUP, including #101408-1 in the subject, . Search for plush rattle…I’m sure I saw it there! Thanks for the tip, pjeduc8r. I searched thefind.com but was unable to find the same giraffe. That the one! Thanks for finding the giraffe! I'm not sure if I"ll purchase it off of Ebay. It's a little over-priced, but I'll keep my eye on it! Thanks again! If you are still looking? Did you get your giraffe yet? Two on ebay now.